Great for Darts-Foosball-Air Hockey-Dome Hockey or Shuffleboard! 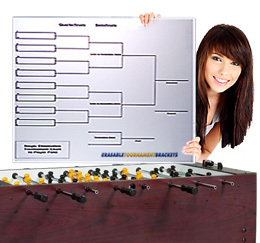 Our EXTRA LARGE 22 x 34" Erasable Tournament Brackets are perfect for all of your tournaments! These single-sided, beautifully printed, laminated tournament brackets are extremely durable and can be used many times over! 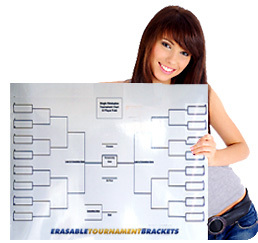 Our Erasable Tournament Brackets are made of Heavy Duty Poster Paper with Dry Erasable Laminate. They easily roll up to transport from one event to another! As a BONUS - You will receive one FREE Dry Erasable Marker with your order and FREE Shipping. This is the perfect marker - VERY EASY TO WIPE OFF so you will get MANY, MANY YEARS of use from our Tournament Brackets. Contact us for SPECIAL pricing on orders of 5 charts or more! EXTRA LARGE Re-Useable Tournament Brackets! 22 X 34" Single Elimination Blind Draw Tournament Brackets! $29.99! You get one single-side re-useable chart with a FREE Marker and FREE Shipping! 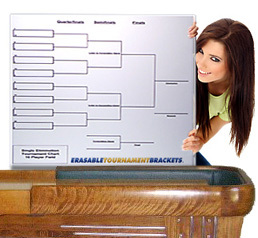 22 X 34" Double Elimination Blind Draw Tournament Brackets! 22 x 34" Single Elimination Seeded Tournament Brackets! 22 x 34" Double Elimination Seeded Tournament Brackets!